Modern iPhones take fantastic pictures, but even with a case attached, the slim exterior doesn’t provide the confident grip of a traditional SLR camera. If you miss that tactile grasp, Miggo’s Pictar One ($100 on Amazon; $110 for Plus-sized iPhones on Amazon), is an ingenious—although imperfect—solution. 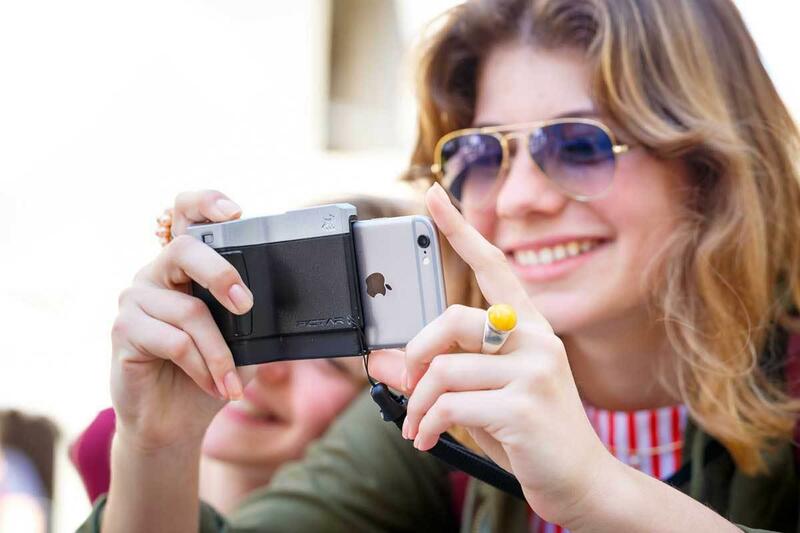 Pictar One is an ergonomic iPhone grip that emulates the look and feel of old-school cameras. The all-plastic accessory features a standard quarter-inch tripod mount on the bottom, along with physical multi-state shutter button, zoom ring, and a pair of knobs to adjust exposure or perform other tasks. 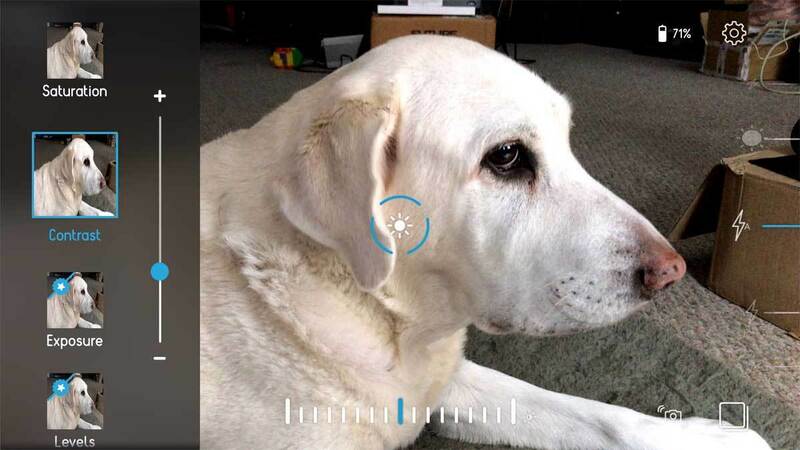 Pictar One adds SLR-style versatility to taking pictures on iPhone by pressing or turning physical buttons instead of relying on software alone. Two versions are available: Pictar One for smaller models, and a Plus model for larger smartphones like the iPhone 7 Plus. To attach, expand the spring-loaded base and slip your iPhone into the grip bottom end first. This leaves half your device exposed, but the design accommodates thinner cases while remaining easy to remove when necessary. 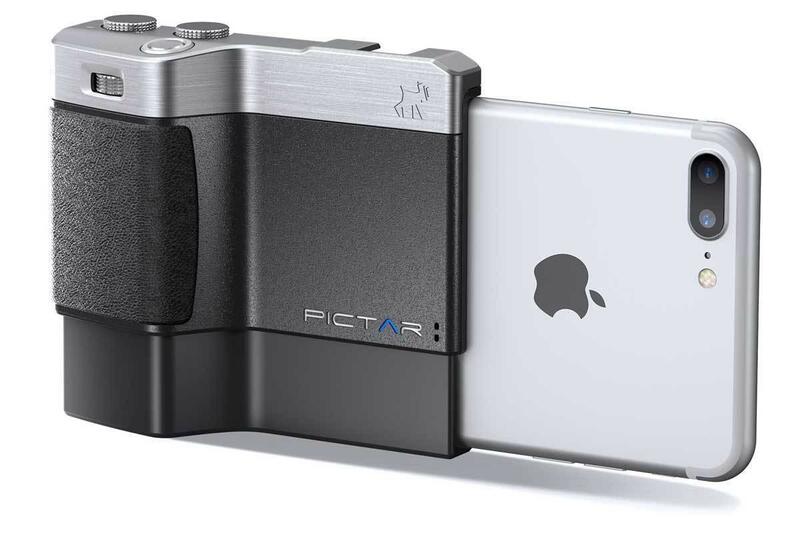 Pictar is designed for mostly one-handed control, even with the zoom knob on the front, which doubles as a selfie mode shortcut when pressed. The grip ships with a padded carrying case, as well as wrist and neck straps that attach to the front. I initially had doubts about how firmly the grip would hold my iPhone, but I carried it around with both straps and even held it over a raging Niagara Falls without incident. While the attachment is solid, I’m less confident about the build quality. The lightweight plastic (only 0.17 lbs.) feels creaky, cheap, and easily susceptible to damage from being dropped. I wouldn’t recommend using Pictar without a case and screen protector for iPhone, because the grip alone provides little defense. 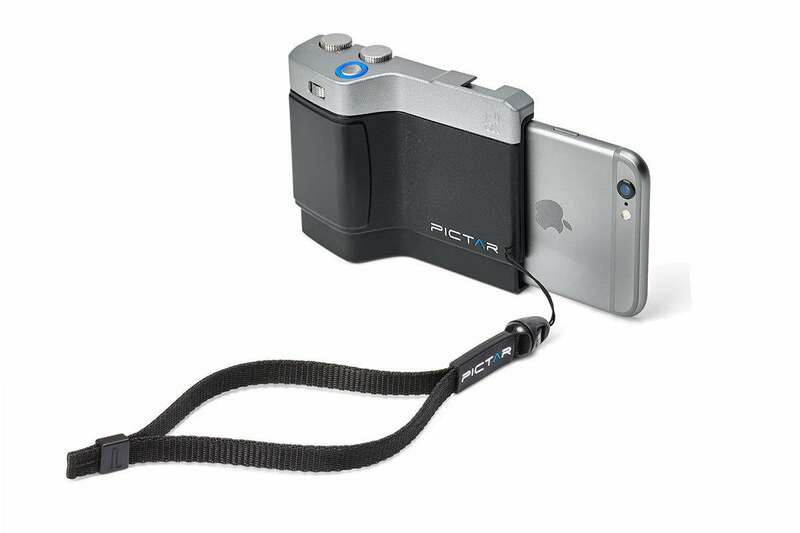 Pictar One includes wrist and neck straps for carrying your iPhone like a traditional camera. Also included is a padded case. Pictar One only works with a free companion iPhone app—the grip doesn’t support third-party camera apps, or Apple’s own for that matter. That’s because the grip uses a patented ultrasonic connection powered by a single half-AA battery for up to six months of use, which adapts tactile buttons and knobs into software functionality. Thankfully the Pictar app is pretty good, although it lacks raw-format options and must be manually launched by tapping the home screen icon. Turning the smart wheel atop the grip switches between nine different modes: Auto, Sports, Macro, Shutter Priority, ISO Priority, Manual, Selfie, Movie, and Filter. Pressing the shutter button halfway locks the exposure, while a full press snaps the picture—just like a stand-alone camera. Additional options tweak the image before it’s taken or apply live filters by swiping your thumb across an on-screen virtual wheel. App settings allow users to customize what each wheel does, as well as toggle features like HDR, aspect ratio, flash, grid, and more. The app is straightforward and easy to use, but the image browser is slow updating thumbnails for new images, and unreliable when displaying geolocation data. (According to PictarApp, my photos were all taken in China or Israel.) There’s also no way to crop or apply filters after images are taken without jumping to another app, but you can share or delete directly. Pictar’s companion app offers plenty of adjustment options, but the grip itself can’t be used with other third-party apps. Despite the questionable build quality, Pictar One is a capable grip for iPhone. It’s too bad the hardware can’t be used with any camera app.